Chevy 4.3 engine first came to the public’s attention in 1985. This was first used inside of the GMC series trucks and vans. The popularity grew larger and Chevy developed the 4.3 inside of other makes and models. This Chevrolet engine is one that includes a base of 200 horsepower or more. We have the Chevy 4.3 engine sitting in our warehouse perfectly rebuilt. Our job here is to rebuild Chevrolet motors. We’re one of the top companies you’ll find online that will give you great pricing and even better quality. You get it all at https://www.rebuiltengines.co. Not all engines that are created end up being used in more than one vehicle. Every automaker has had its share of good and bad engines. The Vortec series of Chevy is one of its best. It also happens to be one of our best sellers on the website. If it’s quality you want, you won’t have any issues finding that with what is sold here. We know how important the preservation of the OEM concept of the GM based engines is for customers. Our mechanics always get the highest levels of training before attempting any Vortec series rebuilds. Engines do not collect dust or rust inside of our facility. This is because we do two things daily. The first is that we’re always building motors to sell. The second is that engines are shipped multiple times here daily. We always have engines arriving and departing to various destinations. This means anything in stock or listed on this website can ship out as early as today if you place an order. This type of service for a Chevy engine is a little hard to come by online. 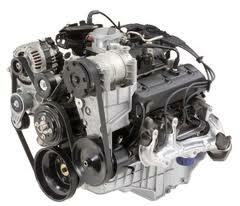 We know the difficulties that are out there when researching an engine to buy. We’ve already eliminated the hard work that customers usually have to do before purchases are made. Warranties are something we give out not because we have to. We do it because customers expect it and we’re not afraid to warranty our work. Some companies that actively sell the 4.3 engines do not warranty anything. Getting engines rebuilt takes a lot of investment into time and machinery. We’ve made the correct innovations into our company to help make us better. You always get more than fair pricing, a great warranty and same day shipping here. The customers that order from this website trust us to be their provider. We take this trust seriously. We’re constantly working on customer satisfaction and improving our company as one of the top rebuilt engine companies on the Internet. We use a simple but powerful form to give quotes. Use it right now and you’re pricing will come to you online. Put in the details that it asks you. If you have a problem, you can always call into our toll free number. We’ll help solve any issue you have. Our engine experts provide you with our lowest engine pricing when you call. Ask us anything. We want you to have a great experience buying a rebuilt engine online.